Note: The Bennachie Visitor Centre is closed for the winter from 29th October until 1st April. 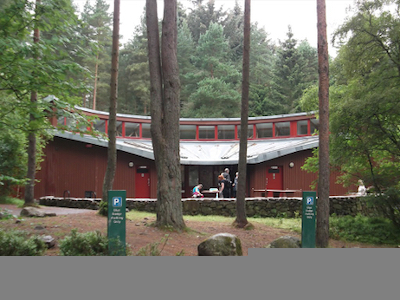 The Bennachie Centre was opened by Honorary Bailie HRH Prince Charles on 27 April 1995. It interprets both the interesting natural and social history of the hill. Free Entry with exhibition, maps and snacks shop (hot and cold drinks), accessible toilets. For general enquiries please telephone 01467 681470 or e-mail bennachie.warden@aberdeenshire.gov.uk. See Bennachie Visitor Center in Google Maps.